Yunquera is a town of Roman origin with a medieval layout belonging to the district of Sierra de las Nieves. Head into the Natural Park of Sierra de la Nieves, discover the "Catedral de la Serranía" (Cathedral of the Highlands) or take part in the "Pinsapo Trail", one of the most important mountain runs in Andalusia, these are just some of the reasons to visit this town at any time of the year. The name of Yunquera dates back to Roman times and means "meadow of reeds (juncos)". The Roman, Visigoth and Arab heritages have combined in the buildings, farming traditions and cuisine to give this corner of the Costa del Sol a unique atmosphere. The so-called "Catedral de la Serranía", built in 1505, can be found in Yunquera. The church dedicated to Nuestra Señora de la Encarnación is the largest temple in the Sierra de las Nieves. It has three naves and the cupola of the transept is decorated with relief work. On arriving in Yunquera you will also recognise the blue enamel tiles covering the bell tower. Inside the church are the figures of Nazareno from the 18th century, San Sebastián, the Virgen del Rosario or the Virgen de la Salud and Esperanza, among others. The Torre Vigía, better known as the "Castle", was built between 1808 and 1812. It served as a watch tower for the Spanish troops during the War of Independence and was declared a Place of Cultural Interest of the Spanish Historical Heritage. A circular cylindrical-shaped watch tower remains from the Arab period and is known as the Torrecilla Árabe, together with the ruins of the Castle, which is where the Parish Church is to be found. Water and snow are some of the natural riches that have accompanied Yunquera over the centuries. Try the crystal clear water from El Poyo Fountain and discover the Pozos de Nieve de Yunquera (Ice Houses), if you visit in winter. These wells are in los Ventisqueros Mountain Pass at an altitude of 1600 metres and were used to store and supply ice to the whole of Malaga province. Art lovers will particularly enjoy the Casa-Museo Paco Sola. The museum is home to a collection of some 20 oil on canvas and wood paintings. This space also includes the tourist information office where you can find out more about the routes, monuments and history of the city. A good example of local architecture can be found in the hermitage of the Cruz del Pobre. Located next to Yunquera cemetery, it dates back to the 19th century, and houses the figure of Cristo de la Cruz del Pobre. This figure features strongly in the Good Friday procession, when men and women separate for the evening, the men following the outbound journey of the saint while the women follow the homeward journey. The tiny hermitage of Nuestra Señora de Porticate is always filled with light and decorated with flowers. It was built in the 18th century and remodelled in 1929. One of its curious architectural features is the cupola, which is painted Rococo style. 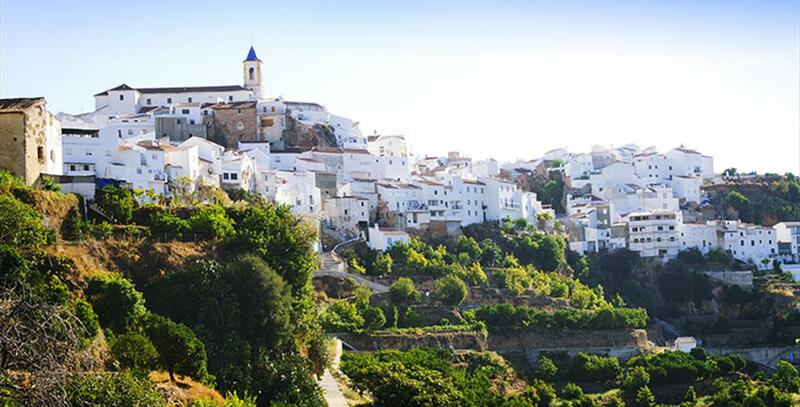 Yunquera is 60 kilometres from Malaga city centre, in the Sierra de las Nieves. By car, leave the capital of the Costa del Sol on the A-357, continue along the A-354 and lastly, take the A-366 until you reach the town. In the Natural Park of Sierra de la Nieves and 681 metres above sea level, Yunquera is an unbeatable destination for enthusiasts of adventure sports. Hiking, climbing, horse-riding, caving, 4-wheel drive, mountain biking and ballooning are just some of the activities you can try in the area. 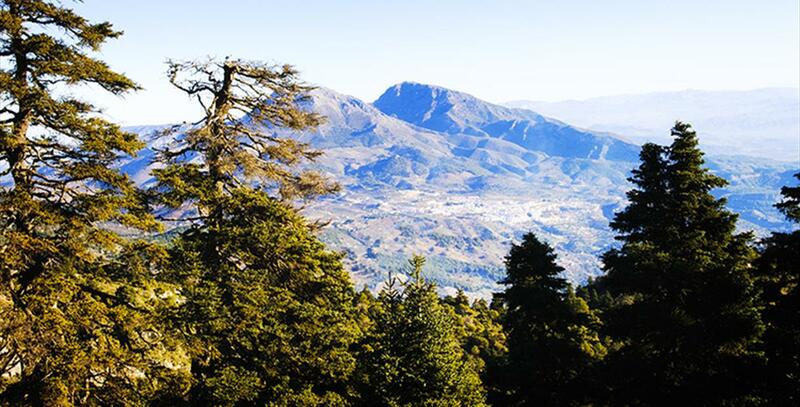 Yunquera has six natural viewpoints over the pinsapar (Spanish Fir Forest) of Sierra de las Nieves. The Natural Park of Sierra de las Nieves has been declared a UNESCO Biosphere Reserve and awarded the EDEN "European Destinations of Excellence' prize in the Intangible Tourism and Heritage category. This park extends over more than 20,163 hectares and is one of the richest ecological strongholds in Andalusia thanks to more than 3000 hectares of Spanish fir (pinsapo), a species in danger of extinction. The Torre Vigía is now home to the Yunquera Observatory and the Visitor Reception Centre at the Natural Park of Sierra de la Nieves. In spring and summer the centre offers workshops, courses and a number of scientific and astronomical activities. Yunquera is known for its different celebrations, many of them of a religious nature. Its Holy Week is among the best known in the Sierra de las Nieves, as the first brotherhoods came into being in 1648. We also recommend the celebration of El Traslado of the Virgen Chiquita, which takes place before the traditional romeria (popular pilgrimage) on 15 August, the Romería del Porticate, or the beautiful Corpus Christi, when the entire town is decked out for the occasion. Other times of the year when Yunquera awaits you with its best smile include: The Fair in honour of the patron saint, Nuestra Señora del Rosario and San Sebastián, held in October, Yunquera Carnival, with parades, dressing up and the traditional burying of the sardine; and San Juan bonfire night. Yunquera Guerrillera is an ode to the past in which for three days the yunqueranos commemorate the War of Independence against Napoleon's troops. This is a historical re-enactment in which you can relive the life and historical events at the start of the 19th century. But without a doubt, one of the most famous celebrations is the Wine and Chestnut Fair. Declared of Special Tourist Interest in the Region, it is held in October and the programme includes a flamenco festival, tourist excursions, tasting sessions and musical performances. Yunquera's cuisine is closely linked to the huge agricultural diversity of the zone, thanks to its prodigious geographical location and its climate. 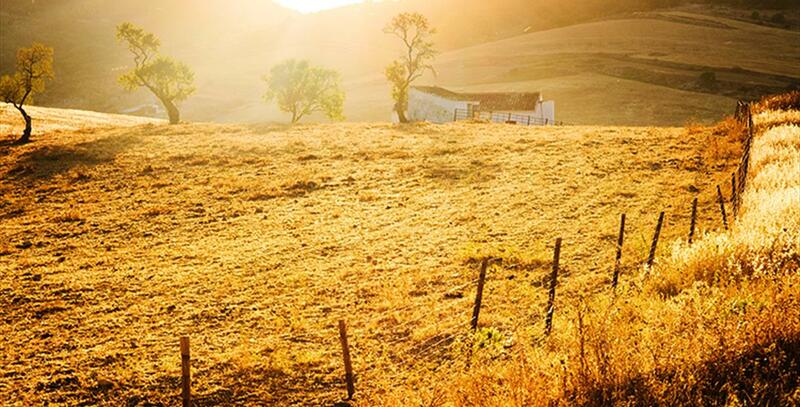 Grapes, almonds, olives, chestnuts, oranges, lemons and avocados are all grown in the area. Typical dishes from the region include: "Sartená" of fried "papas" (pan of fried potatoes) with green peppers, the olla de berza (a filling casserole of cabbage, pulses and meat), caldereta de cabrito (goat stew with potatoes and spices), garlic rabbit, piriñaca (tomato, pepper and onion salad) and malcocinao, a dish prepared with chick peas, lard, tripe, chorizo and black pudding. And for the sweet-toothed we recommend buñuelos and empanadillas con cabello de ángel (pies filled with angel hair). Yunquera"s geographic location and abundant water might have attracted men in prehistoric times. The Romans settled in the area, calling their settlement – scattered farmhouses and villas – "Juncaria", a word meaning "sweet grass meadow". The Arabs knew how to take advantage of the water resources coming down from the sierras. The designed gardens and an ingenious irrigation system to make easy use of the water flowing down in springs. In so doing, they lay the foundations of a farming tradition that has changed very little in all these years – as can be seen in the valleys of the rivers Grande and Jorox. They also built a fortress and a lookout tower in the area. In May 1485, Yunquera fell to the army of the Catholic Monarchs. The 150 Moors living there agreed to be treated as vassals. They could keep their property, religious practices, customs and traditions. In exchange for this, their fort should have a Christian warden. Their first governor was Diego de Barrasa.